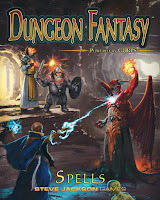 Today, I am reviewing Spells, the Dungeon Fantasy RPG Magic book. The magic system has little to no changes from the GURPS system that is published in the Basic Set and expanded in GURPS Magic, and I have discussed my feelings on the mechanics as such in brief in previous posts. 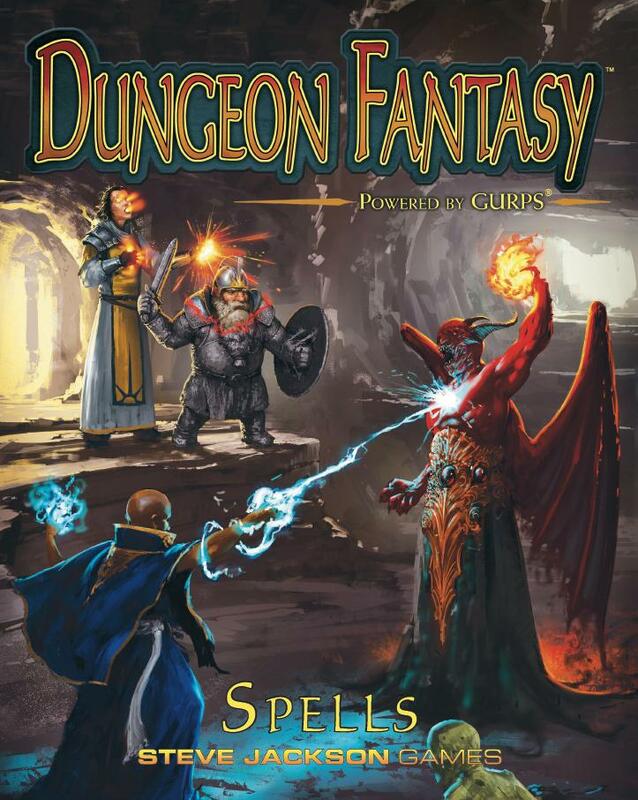 I do worry that I keep reviewing these new books through the lens of a "slightly experienced GURPS player and GM" person though which I don't think is entirely helpful for the, "I've never even heard of GURPS, but Dungeon Fantasy RPG sounds like something right up my alley" crowd. This book, in that context then, absolutely does its job, but let's take a closer look. This is an 82 page book, consisting of the rules for the GURPS magic system, and a compendium of spells. Subtracting some nice cover art, table of contents, introduction, useful appendices, an index, and a printable spell list add-on for caster playable character, the content comes in at about 69 pages. These 69 pages can then be further subdivided into 11 pages explaining the mechanics of the system in Chapter 1, and a 58 page catalog of spells. Holistically, the art for the book is fantastic, and the organization makes as much sense as could be hoped for. A neat design element are cheat sheets built right into the covers that make looking up some of the more difficult rules on the fly less arduous. Content wise, the book is one chapter of mechanics, followed by a catalog of spells, with a smattering of useful player advice throughout in asides. For those that already own GURPS Magic and Pyramid #3/60, this book might almost be redundant, but having all the data in one place, formatted and revised, and moderately rebalanced as opposed to keeping tabs on "This spell is adjusted slightly in this book, and that spell was introduced in this one," could be worth the purchase if Dungeon Fantasy is your preferred mode for GURPS. The next statement is completely subjective, (but look, when you read a review, you better expect opinions to show up:) the only place I really like the default magic system for GURPS is in Dungeon Fantasy, so I think, personally, that this book has value for me, even as someone that already owns several hundred dollars worth of GURPS material, even if that value is slightly marginal. The one small bummer about this book is that enchantments are (almost) completely removed except for a few "first class" ones, and all alchemy is removed. This is slightly remediated with the Dungeon Fantasy Magic Items supplement, which basically includes pricing for most of the important enchantments and alchemical talismans that have been removed from this book, but that's a bit for another review. One final note, the organization of the spell sheet at the end of the book is a little weak in my opinion, making some columns gigantic that only need one or two numbers, while others that might have a lot of text can barely fit a few words. Players will probably do better using one of the automated tools for GURPS character sheets like the official GCA application, or the free GCS application, or just plotting it out on simple line paper instead. This chapter basically goes over all the rules. Some people might think that 11 pages are a bit overkill, and they are mostly correct; that's why the cheat sheet is all of one page with comfortable amounts of white space and a modest sized type. A lot of the information is redundant with rules already explained in Exploits, for example, it explains that all spells function as skills, explains the implications of skills, and how success rules and quick contests work; all fundamental tenants of the Dungeon Fantasy and GURPS system, just repeated for convenience. It also includes verbose clarifications and examples for any of the rules dealing with less common situations. All in all, I think the chapter would be easy for a novice to understand, if not slightly long winded. An experienced RPG player, and especially someone who already knows GURPS could easily scan through the section and then be mostly satisfied with the cover insert cheat sheet. On the other hand, the verbosity could be helpful if someone gets stuck up a creek without a paddle and really needs a detailed hands-on example to get a grip on the system. The chapter begins with a small guide on how to read spell entries, each spell entry has about a paragraph or two of free-form descriptive text, a category that helps someone understand which rules in the previous chapter apply to it (For example, is the spell a melee spell that requires touching the target, or is it a long range informational spell, and what are the rules for each?) And then a few more critical details, like how much energy it cost to cast, how long it takes to cast, and how long it lasts when it is cast. The spells are arranged by college, and all the colleges are in alphabetical order. Inside of each college, the spells are in alphabetical order. When you compare this to the organization in GURPS Magic it makes Dungeon Fantasy - Spells a much more helpful research tool when trying to look up data on a given spell quickly, for whatever reason that might be. The spells also indicate the prerequisites in relationship to the three types of magic included in Dungeon Fantasy RPG: Wizardry, Clerical, and Druidic, which is a nice touch for telling quickly if your particular caster occupation can learn a spell that you are interested in. 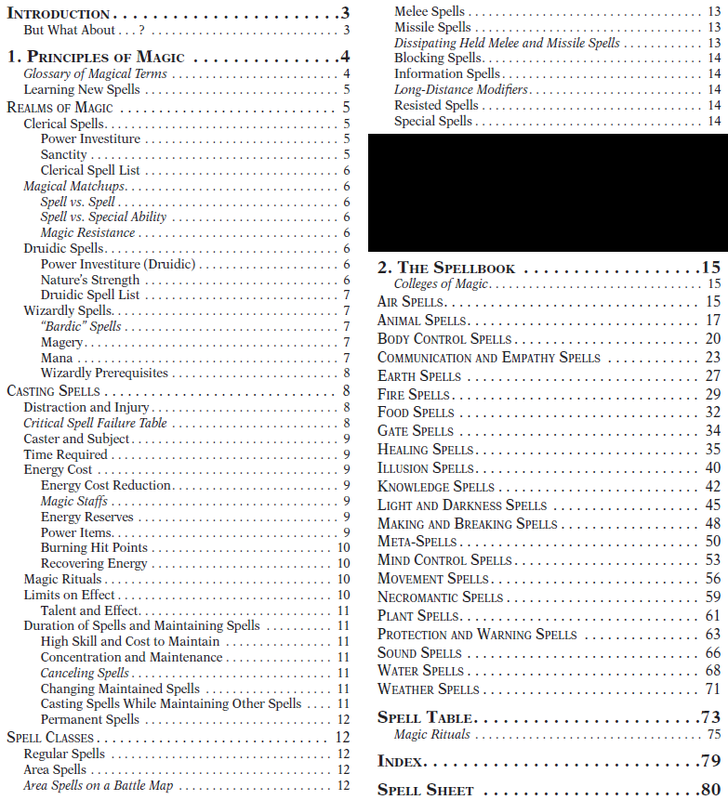 A fully alphabetical list of spells are available in the appendix immediately following the chapter for even easier navigation and lookup as necessary. The chapter contains... by a rough estimate from counting how many spells were in one column on one page in the appendix and multiplying, about 400 spells give or take some tens, so there is a lot to work with here, and I think it accomplishes its goal of presenting the information in an easily understood way, trimming spells that are unnecessary clutter for a sword and sorcery game, and making it easier to peruse for future casual research. If you are new to Dungeon Fantasy RPG, this is an essential book. If you are well steeped in GURPS 4th edition already, this book might be a bit auxiliary, but still a good reference. The art is definitely leaps and bounds above that found in GURPS Magic for sure. For almost any environment besides Dungeon Fantasy, I kinda prefer Power based approaches like Sorcery, Divine Favor, and Psionic Powers, or Ritual Path Magic if I want magic to be really exotic, but for Dungeon Fantasy, the 1 skill = 1 spell; things cost a ton of energy so you need lots of power stones or power items, and magic sometimes defies the expectations of all the other orderly systems in GURPS -- that system feels right for Dungeon Fantasy. I'm also a little disappointed that there are a lot less fatigue damage spells in this list, but I suppose I can house rule them in, if I like the majority of the content in this book. "I'm also a little disappointed that there are a lot less fatigue damage spells in this list"
Compared to GURPS Magic? There really aren't a lot of FP-loss inducing offensive spells in GURPS Magic. Or in previous DF works, either, that I can think of (sorry, no book availability as I write this so I can't check.) 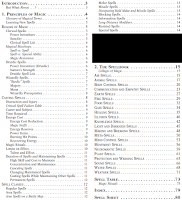 What FP-draining spells are missing in Spells that in GURPS Magic? Hunger, Thirst, Steal Energy, Devitalize Air, and Icy Touch, among others that are too slow acting to be counted as combat skills or be especially appropriate for any campaign that isn't meant to be a battle of attrition, which doesn't directly suit the Dungeon Fantasy genre, to be fair.